Last night I watched the movie Zouzou directed by Marc Allegret in 1934. Jean and Zouzou are two orphans adopted by a sideshow talker. He presents them in the circus as freaky twins because Jean is white and Zouzou is black. Very strange indeed. 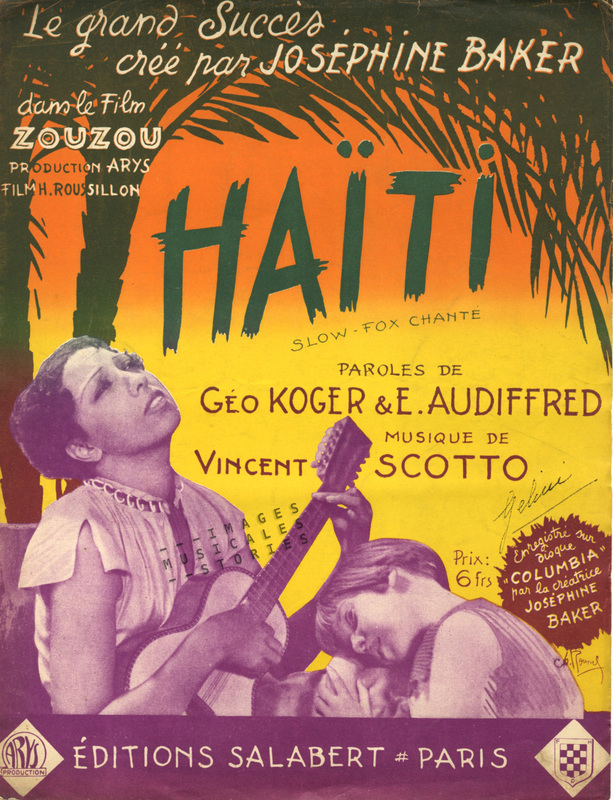 Josephine Baker as Zouzou and Jean Gabin as Jean. As adults, Jean (Jean Gabin) becomes a sailor and Zouzou (Josephine Baker) a laundress. Zouzou has an unrequited love for Jean who is only able to love her as a sister. A few intrigues later Zouzou, who is a talented singer and dancer, starts to work in a music hall. And this leads us to the climax of the film when Josephine Baker sings Haïti. Scantily clad in some feathers she sits on a swing in a gilded bird cage like an exotic bird, ending the song with an elegant stage dive. Bizarrely, for the cover of the sheet music the illustrator selected another scene from the film. Was the scene in the cage too risqué? You can judge for yourself or just enjoy the talented Miss Baker.